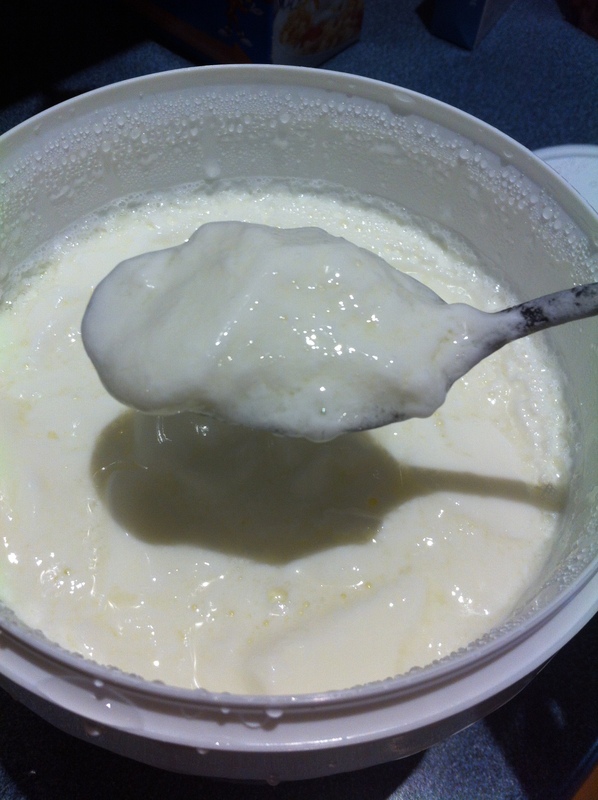 Combine two cups of the warm milk with 1/2 to 1 cup of yogurt that you d from the last batch. You can even freeze this and thaw before using. The next day strain the yogurt in a cheesecloth lined strainer for 2 to 4 hours depending on how thick you want your yogurt. Once I wrapped the whole steel pot in towels and put it in the oven. It worked but not spectacularly. All that being said, I’ve been making yogurt and not buying it for about a month. It’s quick and easy and TASTES BETTER. Other people in my house are eating it and not saying yuck. They are mixing it with honey or maple syrup, but they are eating it. I have been putting it in a small container with honey and a few frozen blueberries, by the time I get to it at work, it’s perfect. And, it’s cheaper, and you feel clever because you made it. 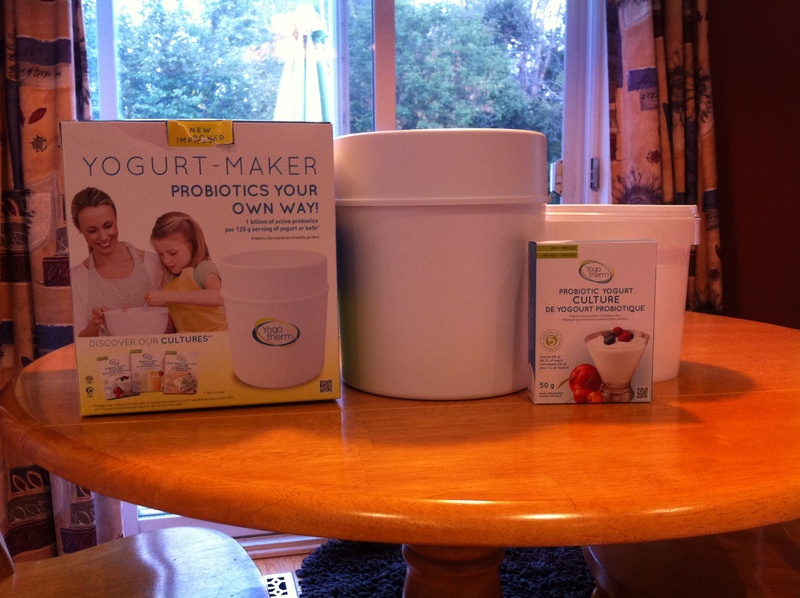 Her yogurt maker is called a Yogotherm, it costs about $50, it uses no electricty, and it’s the bomb. I was an immediate convert after one use. I looked around to compare prices and the best deal was Costco as it came with five envelopes of starter cultures. Amazon was about the same price but no cultures. My Yogotherm, this is what comes in the box. One envelope of starter culture. To be clear, I’m pretty certain that the company who makes Yogotherm has a pretty good profit margin built into their price. Essentially, it’s a food grade white pail that is meant to be inserted into a formed Styrofoam lined plastic container. The Styrofoam is exactly the same dimensions as the pail and this is why it works so well. 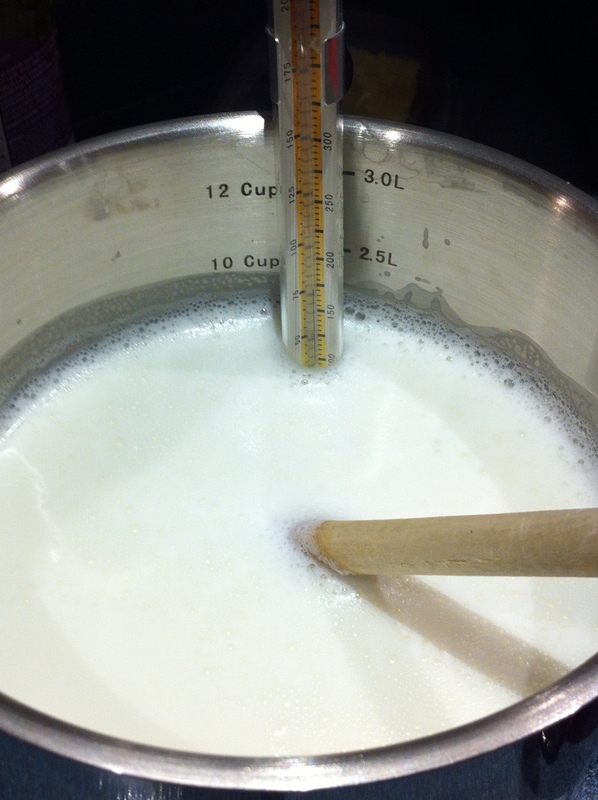 It is simple, yet pretty darn clever, and seeing as it will cost me nothing to use (remember it’s non-electric) it will essentially pay for itself by the time I make 12 batches of yogurt-about a month and a half. I’m getting that price because $4 worth of milk is making 8 cups of yogurt before straining it, and 5-6 cups afterwards. I’m paying at least half or less of what it costs in the store. 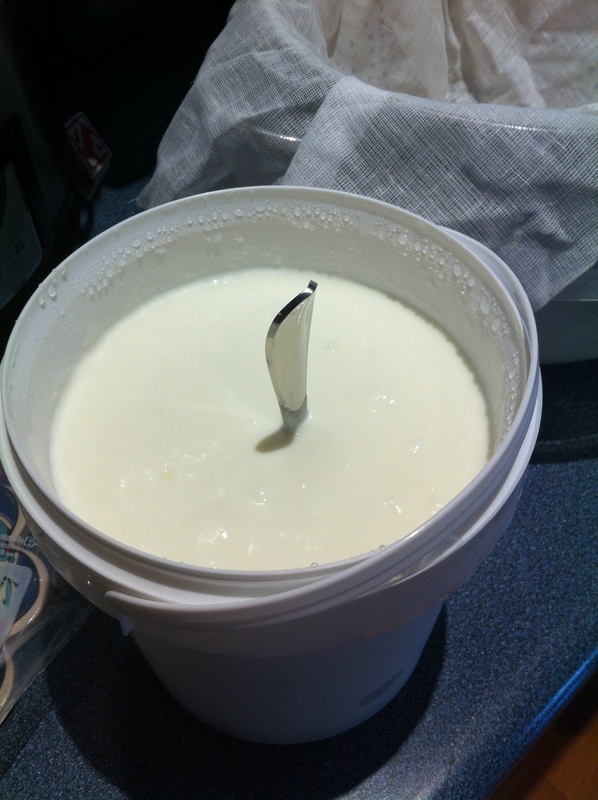 So, on to the making of the yogurt, pretty much the same recipe as above, heat, cool, add yogurt starter, mix and put in pail. The instructions say 5 to 7 hours, but again I left it about a dozen. The next morning I opened the pail to find wonderfully thick yogurt that was almost as thick as Greek yogurt (I still strained it, but for less time), but thick enough that you could get away with not straining it if you didn’t want to. Let it sit overnight and Voila! Two thumbs up for the Yogotherm. I don’t know if I will have any more to say about yogurt after this. 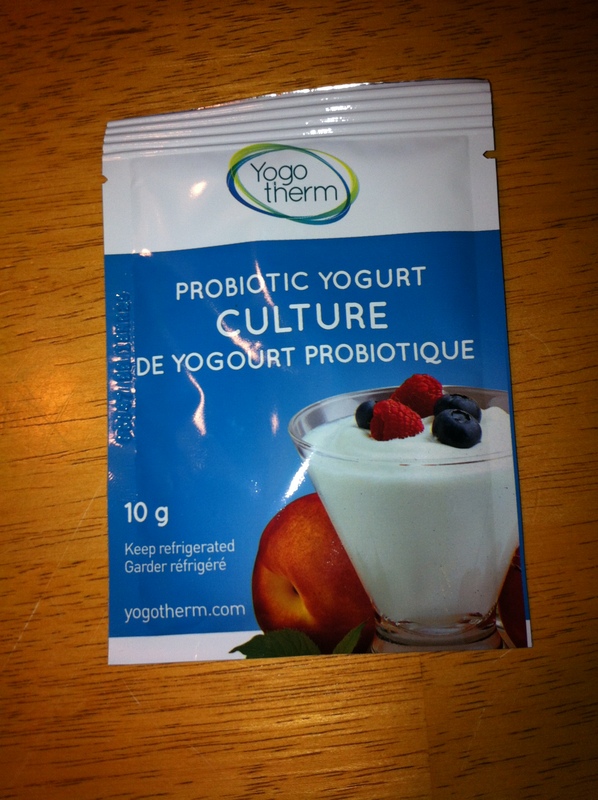 I am very happy with the yogotherm and can’t see how I could possibly improve on it. Either of these methods works well, and for those of you still wanting to try to make your own, it doesn’t get much easier. I promise that you can totally do this. I do need to work on a post about the leftover whey, I’m baking bread with it at this very moment. Stay tuned. Next postFermented Peach Vinegar- Success!